The 1989 Revolution that marked the fall of Communism in Romania, seen through the eyes of a couple living in Zalau, the smallest county capital. 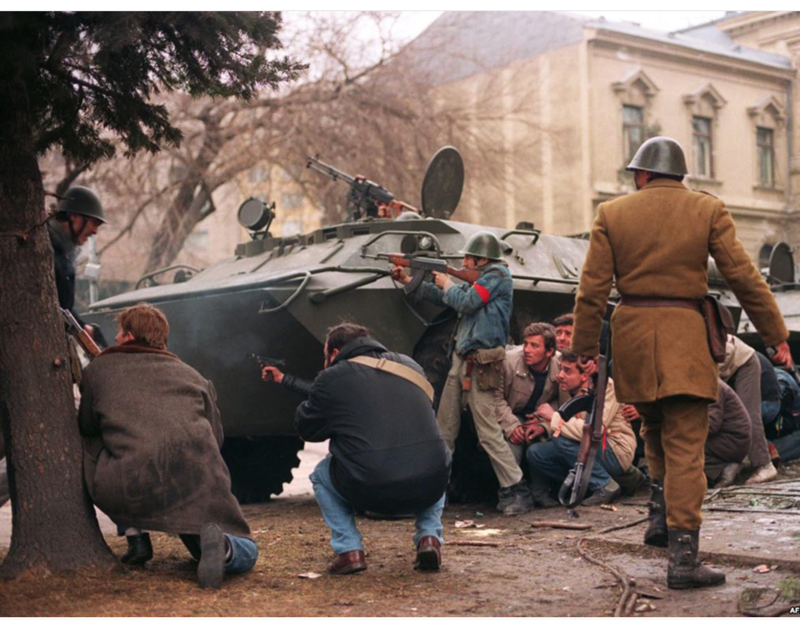 On the morning of December 22, 1989, Zalau was covered in silence and in an inappropriate spring. Zalau is a small city in northwestern Romania, where Viorica Mesesan and Ilie Mesesan met, got married, received an apartment from the State, gave birth to a child and then experienced a Revolution. Ceausescu had held his last speech on December 21, 1989, in front of millions of burning heads, deaf to his words (or maybe for the first time actually listening), and on December 22, at noon, he and his wife climbed in the helicopter and ran away. Viorica and Ilie went to work that day like on any other normal day . Viorica, 35 back then, was working for the municipality in a building right next to the central square. She and her colleagues were gathered in the main hall that day, in front of a TV, watching mesmerised what was going on there. She remembers Ceausescu’s last speech, promising to raise children’s allowance by 100 lei and Dinescu, announcing that Ceausescu and his wife ran away. Two of her colleagues took Ceausescu’s portrait, threw it on the ground, stamped on it and then ran out of the building to the central square, trying to convince other people to join them. It was the portrait of a person no one had even dared to make a joke about before, which now turned into little glass pieces. Her husband Ilie, 34, remembers too such an image: different portraits of Ceausescu, flying out of the windows and breaking down on the alleys of the factory where he was working. The morning silence which was covering the city was only a deceiving one. There was a great tension hiding behind that silence which exploded when the announcement was made that Ceausescu ran away. Those in factories stopped their work and formed a march to the center of the city. Around 3,000 women and men, taking advantage of the almost spring-like winter that year, singing and shouting among radio announcements, walked to the central square (in picture). Ilie was among them and he perfectly remembers the enthusiasm he was feeling then. An enthusiasm his wife doesn’t recall. She only names fear and confusion among the feelings. “I cannot say that we were very enthusiastic. We didn’t really know what was happening and what kind of consequences this would have on us,” remembers Viorica. The people gathered in the central square waiting to see what will happen. Who – and what – will come next. The secretary of the county, a woman called Maria Stefan, tried to talk to the people, but they refused to listen to her. They were only receptive to the speech of the Army Commander, who assured them that no fire was shot or would be shot, that he gave orders to the Army not to interfere with the population. In the end, indeed there was no gun shot. At least Ilie remembers it that way and his wife too. But Ilie’s cousin, Nelu, a communication engineer, remembers the story differently. He was called in those days by the secret police (Securitate) to do some interceptions and he recalls perfectly the gun shots, which stayed in his mind for some months after everything ended. But memories are vague and history is just a collection of these memories. Ilie remembers that they were gathered in the central square when they heard the news at some loud speakers. “The Ceausescus were caught in Targoviste. They are being held at the Military Section number…from Targoviste. Please stay calm, there will be a law suit”. He tells it exactly how he heard it that day, using the present tense, like it would happen now. Those were words with such a great impact, words he has never forgotten and have stayed with him for 25 years. The heroes of the day in the small city of Zalau were the figures talking to the people gathered in the central square. They were different factory managers, professors, mostly people who had the power to influence, to capture trust, to assure their place in the new order. Patriotic songs, flags with the communist symbol cut out showed everywhere, loud speakers bringing news, this was the 2-hour gathering in the central square and the short Revolution in Romania’s smallest county residence, Zalau. Then people returned to their houses and followed the Revolution on TV. The TV is the central character in the memories of those days. Ilie remembers that he couldn’t move away from the TV, being mesmerised, incapable of reacting to any other stimulus. „What was happening there was hugely important. We could not afford to skip any information, any image,” recalls Ilie. Viorica was constantly moving between the TV, the kitchen and their 2-year old baby. It was only two days before Christmas and she had to prepare ‘sarmale’, the traditional Romanian food. “Our little girl was crying all the time, maybe she felt in some way the tension and pressure, my husband was effectively stuck in front of the TV, I asked him many times to help me, but he didn’t react, he did not move from there”. The news, the rumours, the figures were pouring from TV amidst the preparations for the Christmas, the cooking, the cleaning, and taking care of the child The rumours were the most tormenting thing, because nobody could tell what was true and what was false. „They were telling us not to drink water because it may be poisoned, that there were terrorists shooting everybody, we were so afraid a civil war would break out,” recounts Viorica. And then on December 25, the things finally settled down. It was the Christmas day and after a short lawsuit, which was broadcasted on TV, Ceausescu and his wife were shot to death by a military squad. 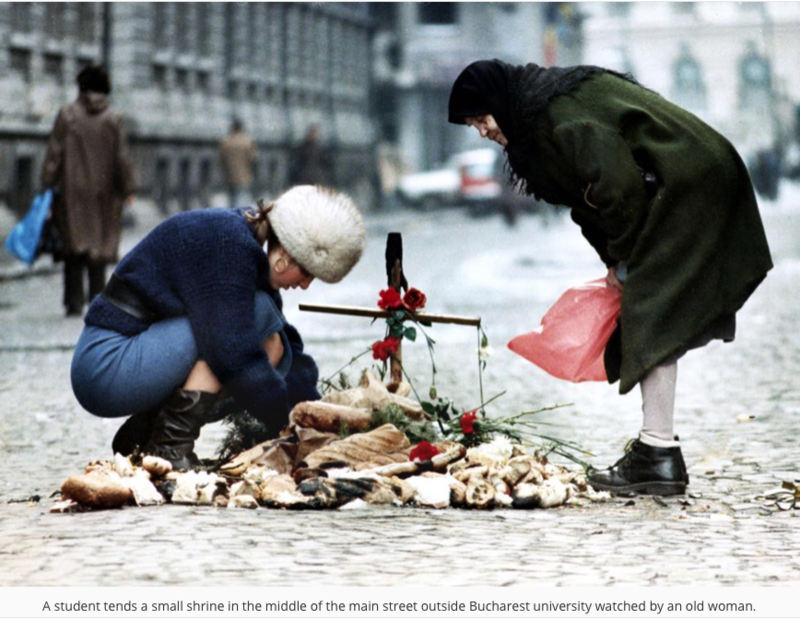 Both Viorica and Ilie still remember the noise of the guns shooting at the Ceausescus, and still recall some images of Ceausescu and his wife lying on the ground and then in their coffins, dressed in their winters coats. „Kids, kids, please behave, people, please” and „I refuse to talk to anybody else except for the Great National Assembly” were the words of Elena and Nicoale Ceausescu during the trial. Words that Ilie still recalls at the present tense. He thinks it was very wrong to kill them. „First of all it was the Christmas day and you don’t do something like this on Christmas day. Secondly they were not alone, there were so many people beside them that should have been also judged and only afterwards a sentence to be passed,” comments Ilie. ”It was suddenly all silence. I am being honest to you, I felt relief, I too was afraid a civil war would break out. I may be wrong, but I guess the majority wanted them killed. We felt they were bad people. Or maybe they made us believe that way through the images they were showing us on TV,” recounts Viorica. New heroes were proclaimed or maybe proclaimed themselves that way. Ilie and Viorica were watching on TV how a new world was settling in. The Ceausescu trial, the foundation of the new party, the new leaders. Some of them were familiar. Most of the things that confused them and brought about fear in those days were never resolved. „Nothing could be proven. Everything remains a mistery,” comments Ilie. Nobody has discovered any single terrorist. A few Army Commanders were prosecuted but almost everybody escaped. The people that talked in the central square of the small city Zalau did find a place in the new order. And the TV got and more important with every day more.